Here's something to think on for a moment: Have you been to a shopping mall lately? What about a Sears? Or a RadioShack? How often do you go compared to a decade or two ago? The number of Americans going to bricks-and-mortar shops has declined over 50% between 2010 and 2013, according to the real estate research firm Cushman and Wakefield — and they've kept falling every year since. 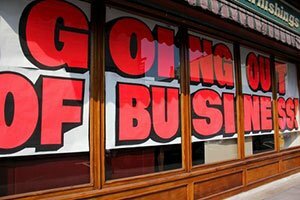 As a result, retail stores are closing and/or filing for bankruptcy at a record pace — more than during the financial collapse of 2008. This Is the Year of the "Retail Ice Age"
So far in 2017, 21 retailers have announced closures. That's over 3,591 stores that are now shuttered indefinitely, according to a March 20 report from Forbes. Even worse, these store closures result in huge losses of American jobs. Forbes estimated over 50,000 people have already lost their retail jobs in 2017… and we're only four months in. There have been nine retail bankruptcies in 2017 – as many as all of 2016, according to The Atlantic on April 10. Analysts estimate over 8,600 more stores will close this year – more than the 7,000 retailers that shuttered in the financial collapse. "With the growth of online shopping and increasing online apparel sales starting to explode, it's no wonder America's bricks-and-mortar apparel retailers are closing stores across the country!" said Money Morning Capital Wave Strategist – and retail sector expert – Shah Gilani to readers on April 28. In fact, "if these trends continue, and researchers expect them to, Wall Street analysts say we could see 50 retail bankruptcies in the next 12 to 24 months," according to Shah. 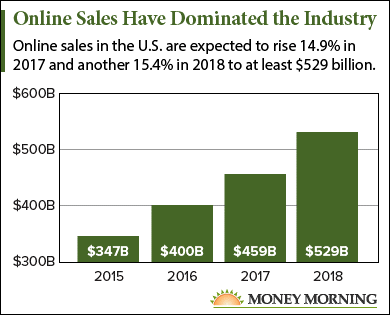 Online sales in the United States totaled $399.53 billion in 2016, up 14.4% from 2015. Sales in 2017 are expected to rise 14.9% to $459.07 billion, according to the Centre for Retail Research. And in 2018, they're slated to grow another 15.4% to at least $529 billion. By comparison, in-store sales at the nation's department stores averaged $165 per square foot in 2006, according to Green Street Advisors, a premier real estate research firm. As of spring 2016, that number was down 24% to $124… and it's been falling steadily since then. "The ease of Internet shopping, the cheaper prices, the ability to comparison shop, and the free shipping has made heading to your favorite mall or retail shopping center look like a waste of time and money," said Shah. Investors have been devastated in the process. Almost every traditional bricks-and-mortar retailer has seen its stock plummet – even the big household names you're probably familiar with. Target Corp. (NYSE:TGT) has sunk over 20% over the past year – from $79.50 in May 2016 to just $57.15 today. Sears Holdings Corp. (Nasdaq: SHLD) stock has lost over 43% of its value over the past year. The poor stock is worth just $10.38 today. And investors in JCPenney Co. Inc. (NYSE: JCP) have got to be screaming right about now. JCP stock has fallen over 40% since this time in 2016. You might be saying to yourself, "This is a great time to buy! These stocks are so cheap!" Here's Shah's advice: Don't buy. It's a trap. "Don't be duped; these plays are fool's gold," said Shah. "What's really happening in a lot of cases is that these stocks have been sold short by smart investors who saw the demise of bricks-and-mortar retailers coming." You see, Shah's been following the retail collapse closely. "The truth is, there's a ton of money to be made trading and investing in so-called retail stocks if you know what you're doing," said Shah. And he's sharing that insight exclusively with Money Morning Members today. Here's how you can collect gains all the way down….